Does your pet have bad breath? Despite what many pet owners may believe, dog/cat breath is not just a nuisance, it's a sign of an unhealthy mouth. Bad breath is caused by bacteria. Over time, bacteria leads to plaque and tartar buildup on your pet's teeth. The result is bad breath, reddened gums, and other common signs of dental disease. As dental disease progresses, other signs can include drooling, discomfort while chewing, and loose or missing teeth. Before scheduling a dental cleaning for your pet, we will conduct an examination and do any pre-anesthetic blood work that may be needed. An IV catheter will be placed and fluids will be used. 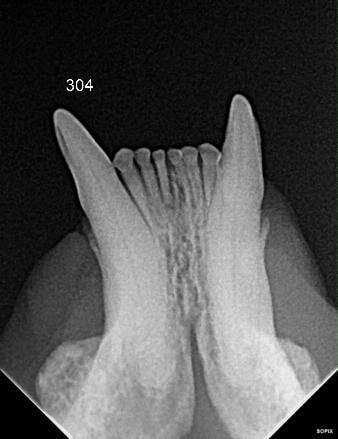 We routinely perform full mouth x-rays to look for disease under the gum line. Teeth cleanings are performed with an ultrasonic scaler, and and each tooth is polished. If teeth appear diseased either on exam or x-ray, we will inform you and discuss options and pricing.